Ruth and Rosel Klein provided Kazerne Dossin with high quality copy prints of the original photos. Ruth and Rosel Klein donated copy prints of certain family photos to the United States Holocaust Memorial Museum in Washington DC as well (2004.143). Josef Klein was born in Kolomyya, then Poland now Ukraine, on 15 November 1905. In 1931 he married Lotte Silberstein, born in Berlin on 28 May 1912. The couple settled in the German capital, where on 20 May 1932 their oldest daughter Ruth was born. Lotte gave birth to a second girl named Eva on 22 July 1934, and to youngest child Rosel on 20 May 1937. Josef Klein owned a store where he repaired and sold shoes. His business was destroyed during Kristallnacht and shortly afterwards the Klein-Silberstein family decided to flee Germany. In July 1939, oldest daughter Ruth and her maternal grandmother Frieda Kahn (b.15/12/1870 in Siedlec, Poland) illegally crossed the Belgian border. They initially stayed at the home of Paula Silberstein (b. 18/06/1908, in Berlin, Germany), sister of Lotte Silberstein, and her husband Julius Kantorowicz (b. 06/06/1909 in Lodz, Poland) in Brussels. The couple had a son named Jacob, known as Jacques (b. 20/06/1927 in Berlin, Germany). On 29 August 1939 Josef Klein, his wife Lotte Silberstein and their two youngest daughters Eva and Rosel also arrived in Belgium. The family found living quarters in Brussels. When Germany invaded Belgium on 10 May 1940, the Klein-Silberstein family fled to Lille, France. However, Lotte Silberstein was very sick with tuberculosis. Josef placed their daughters in a convent run by Carmelite nuns in Lille where they stayed until their mother passed away on 12 June 1940. Josef Klein and his daughters then travelled back to Brussels. In the fall of 1940 Josef Klein placed Ruth, Eva and Rosel in a children’s home, probably the Home des Enfants Assistés in Brussels. Josef visited his daughters every Sunday, until his visits suddenly stopped in the Fall of 1942. The three girls stayed on at the home until April 1943, when they were sent to another orphanage in Ixelles, Brussels. 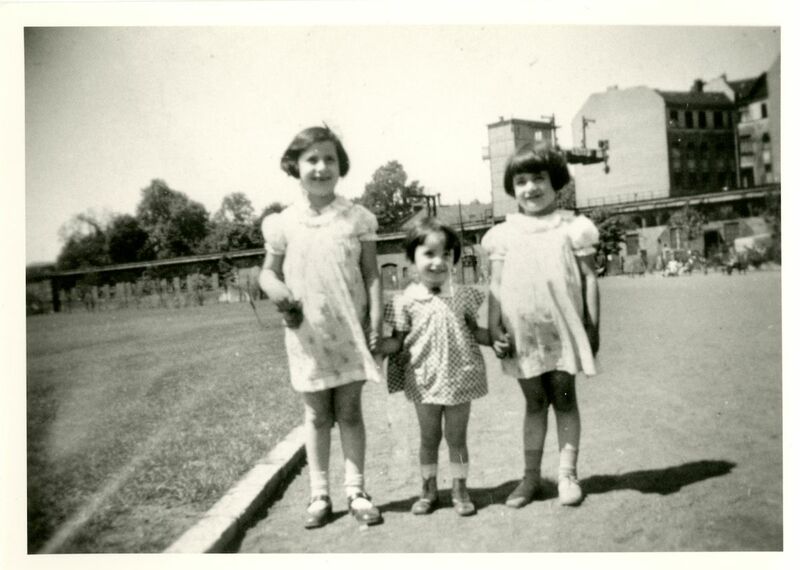 Upon their first visit to the orphanage in August 1943 – after their return from France – aunt Paula Silberstein and uncle Julius Kantorowicz decided to take the girls home with them. Five days later, Julius, Paula Ruth, Eva and Rosel were arrested and brought to the headquarters of the Sicherheitspolizei-Sicherheitsdienst (Sipo-SD) at Avenue Louise in Brussels. On 12 August 1943 they were transferred to the Dossin barracks in Mechelen. Aunt Paula forewarned Ruth, Eva and Rosel to act as if they did not know her or their uncle. Therefore, upon arrival at the camp the girls were considered to be “unaccompanied”. This status probably led to their release on 16 September 1943. The sisters were placed at the children’s home in Wezembeek-Oppem run by the Association des Juifs en Belgique (Association of Jews in Belgium). After a short time, they were hidden by the Comité de Défense des Juifs (Jewish Defense Committee) at a monastery in Sugny. Ruth, Eva and Rosel Klein thus survived the war. After Liberation in September 1944, it became clear that their grandmother Frieda Kahn was their only surviving relative. Paula Silberstein and Julius Kantorowicz were killed after deportation to Auschwitz-Birkenau via Transport XXIIA on 20 September 1943, their son Jacob (Jacques) Kantorowicz after deportation via Transport IX on 12 September 1942. Josef Klein had been deported from the Dossin barracks to Auschwitz-Birkenau via Transport XIX on 15 January 1943 and was also killed. Frieda Kahn was not able to take care of her three granddaughters so they were placed in an orphanage. Frieda passed away in 1946. In January 1948, the Klein sisters arrived in Toronto, Canada, where they built a new life. Ruth, Rosel and Eva Klein all married, and Ruth and Rosel had children and grandchildren. Eva Klein-Shapiro passed away in Ontario, Canada, in 1990, Rosel Klein-Abramowicz on 4 June 2014. Ruth and Rosel Klein, daughters of Josef Klein and Lotte Silberstein, visited Kazerne Dossin in 2012 to record their testimony. As a result of their visit, Ruth and Rosel very kindly provided the museum with copies of several family photos.